Hager Forum recently launched its first intercultural event based on the Chinese New Year. It was an opportunity to encourage international cooperation between different group entities and local partners. From 8th to 19th February Spark and Hager Forum, in Obernai - France, hosted a series of activities; the aim being to build connections between the different group sites, strengthen intercultural character, introduce colleagues to Chinese culture and showcase company values to visiting customers. With this in mind, Hager Forum team worked with Chinese employees to create a programme that will be further developed with each passing year. “We want to make Hager Forum a real meeting place that brings together our company’s various stakeholders and different cultures. This interactions and diversity is essential for all to benefit and develop new projects, both locally and internationally,” emphasised Ana Maria Arteaga, Hager Forum Manager. Every day almost 400 people experienced the special Asian atmosphere at Hager Forum. This year the festivities were centred in Spark, with participants enjoying Chinese-inspired culinary specialities, receiving traditional lucky red envelopes and solving riddles. Flyers and the giant screen in Spark provided information about Hager Group presence in China and Chinese New Year traditions. Meanwhile, decorative lanterns and Chinese music set the mood. 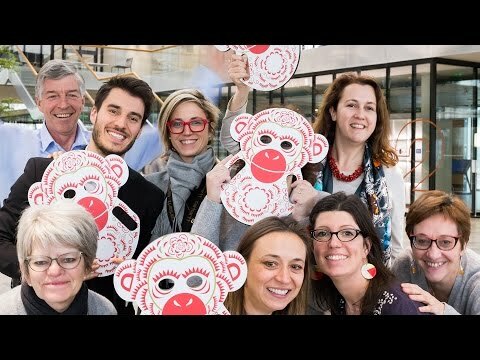 Throughout the entire period there was also a photo booth where colleagues could have their photo taken wearing red monkey masks –2016 being the Year of the Monkey. In total, 150 photos of employees, customers and Italian visitors were put together to create an animated greeting card for Chinese employees from Huizhou, Guangzhou, Shanghai and Beijing. We would like to wish customers, partners and employees from China and everywhere else a Happy Year of the Monkey, full of cooperation.